Wow, you look absolutely fantastic! You look like a character in a movie, and your hair is so beautiful. Ah wow, congratulations on the feature! You look great! Love these photos here, especially the spinning one! Congrats!!! That is just PERFECT!!! your blog is amazing and you always look stunning!! Just found your blog via Littlehouse of Style, and it's so wonderful! You've definitely got some new fans over at our blog. I'm looking forward to seeing more great things from you! Congrats on the newspaper feature! The picture is fabulous! Love the photos and outfit. I adore the shoes, I've been searching for some vintage t-bar shoes for ages but unfortunately I have rather large feet so finding shoes is a challenge! Congratulations on your feature in the Sunday times! Your so lucky! I love your hat with the blue ribbon. Ah these photos are sooo beautiful! And you are beautiful,and stunning..I mean you have a different kind of beauty..different in a good way,magical! :) Really nice clothes too! How very delighted you must feel to be featured in the Sunday Times! The photo is, as always, positively spectacular. Wow ! Your photos are stunning ! I really love the atmosphere : classic, simple, sincere, beautiful. Congratulations! You are stunning and the landscape is beautiful as well! So amazing to be featured. Good for you! With such grace, creativity and style - you deserve it! Take a peek at my vintage Valentino I posted today... I think you will like. I just thrifted a similar skirt and can't wait to style! you look super chic! Your pictures always have a picture-perfect quality to them. I adore the 8th image down. I think it's the prettiest outfit I've seen since days ! Girl, you're my hero ! Following ! I saw your feature in the Sunday Times and it is really inspiring. 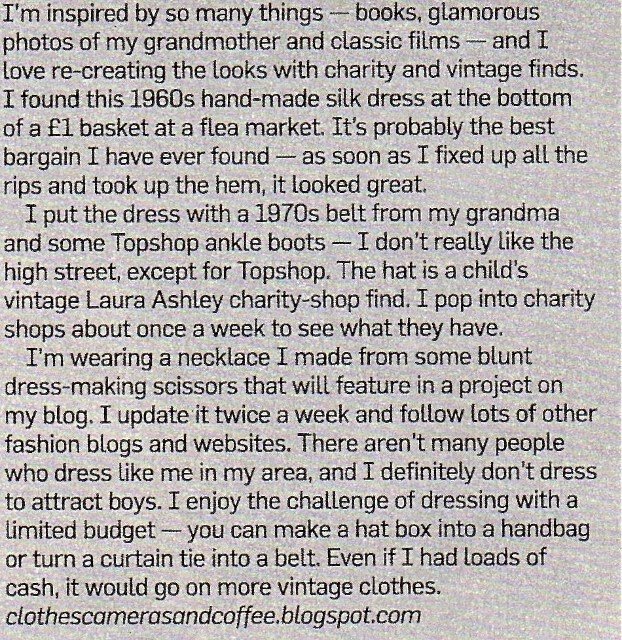 I had seen loads of other blogs that were just about designer stuff and there is no way I could afford that. I love your unique style and how your a charity shopaholic like me! If you have the time please check out and comment on my blog, many thanks. gorgeous, babe! there's just something about your style that's alluring. i love your posts! following you & linking you up! last pic of photo shoot: i love that pose and the gaze...also the blue really pops out! great textural elements in the background and lace skirt. wonderful photo. 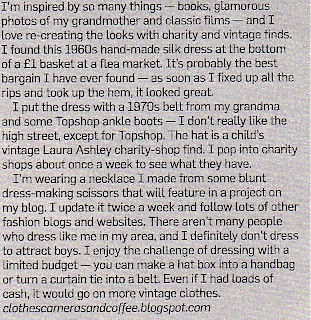 I found your blog by reading the feature in Style magazine, congratulations! Since discovering your blog I've liked several of your outfits but the one featured in this post is by far my favourite, big pat on the back. I'm absolutely loving that outfit and those photos ! I must say this is indeed a very good piece of work. The photos are something that I think is excellency defined at its best. The landscapes and the matching dresses just makes me more nostalgic about the days our family spend in the villages during childhood. I must say this is something that good photography results into.